Oculus Rift executives say the heady experience of virtual reality may command higher prices than conventional games. Those who have had the good fortune to play with Oculus Rift VR headsets seem awfully impressed by what can be done with it, and numerous videos floating around on YouTube attest to its immersive qualities. But there may be a downside for gamers in the form of higher prices for high-end VR experiences. "There will be some who make casual, simpler experiences - maybe bite sized. There are going to be Indie developers that make bigger experiences. 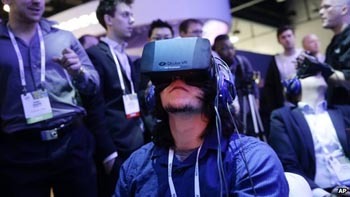 And there are going to be bigger teams that make really big experiences," Oculus CEO Brendane Iribe told GamesIndustry. "And some that we've seen early prototypes of... Well, we've seen some that, boy, would I pay a lot to get that experience in virtual reality." "In VR, suddenly objects have value - and scale and size and depth and I think there will be opportunities for developers to monetize them," added Director of Developer Relations Aaron Davies. Pricing will be up to developers but Iribe noted that "they'd better deliver if they're going to charge more than $50 or $60 for a game." Davies, however, said that instead of just jacking up prices, some studios may take a different approach, perhaps akin to the free-to-play model. "The whole concept of charging a premium is somewhat outdated," he said. "It's not to say it's going to be upfront. It could be this is going to be an experience you get dialed into. We'll see how it monetizes. ... If you create content or an experience that someone is passionate about, you're creating a lifestyle for them. And they'll pay for that."